A controversial incident between reigning Australian Sprintcar Champion Kerry Madsen and Victorian hotshot Tim Van Ginneken has brought a premature end to the A Main at the second round of QSS World Series Sprintcars at Murray Bridge, South Australia. 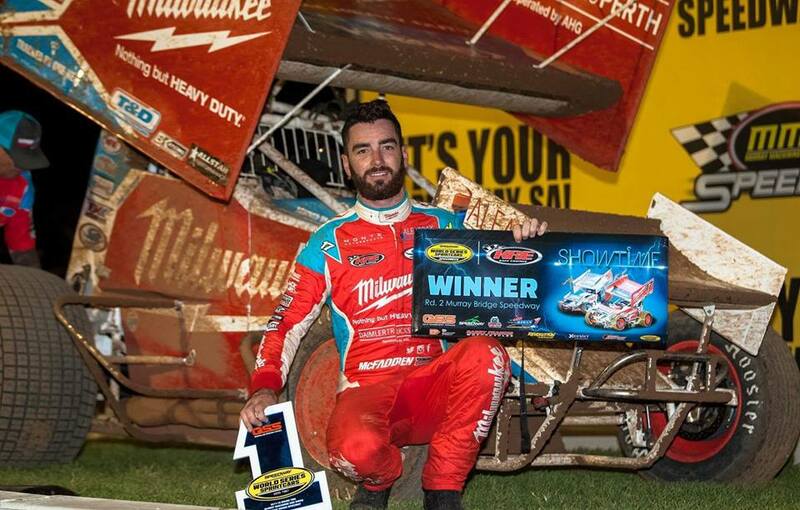 James McFadden claimed a convincing win over Louisianan Jason Johnson and Matt Egel after the race was declared with just 3 laps remaining, with the clash between Van Ginneken and Madsen leaving the Australia #1 car tangled in the catch fence in turn one. Madsen had driven from 15th after coming from the B Main all the way to battle for 5th with Van Ginneken who had gradually slipped back after leading the first 12 laps from his front row start alongside McFadden. At lap 32 however, Madsen drove around the V36 and tucked into turn one to close the door, however Van Ginneken fought to keep the position, making heavy contact and catapulting the A1 high into the catch fence and tangled in the mesh. Madsen was quick to loosen his belts despite the car hanging off the fence, and wasted no time in exploding his frustrations on Van Ginneken as soon as was released from the wreckage. “That’s the stupidest move I’ve ever seen at a speedway,” Madsen said, restraining himself from boiling over on the microphone, however TVG seemed unperturbed by his remonstrations. The controversy somewhat stole the limelight from a phenomenal race, with a track that became racey just at the right time of the night after being very heavy from an unexpected shower at the start of the evening. “I wasn’t sure were going to get a racetrack like that after what it was like at the start, but hats off to the track crew because that was great fun,” a jubilant McFadden said after starting the night with Revolution Racegear Quicktime after a last-minute gear change by the crew on the infield to achieve some higher RPM. Johnson was equally happy with his runner up result, taking him to the KRE Speedweek and WSS Championship points chase lead on 580 points, just four ahead of McFadden and Matt Egel on 557 points in third. Jamie Veal was unable to take the start in the Krikke Motorsport TEH #2 with electrical issues taking the former champion to the infield before a lap had been turned. The series heads to Mount Gambier’s Borderline speedway tonight for round three before a day off prior to round four at Avalon on December 30.